There are many reports of one or two cases of allergy to either grapes or wine, the single article of Pastorello et al. (2003)  reporting 14 severe cases. Exercise-induced anaphylaxis after eating grapes (Dohi et al 1991 ). Oral allergy syndrome to grapes and wine (Giannoccaro et al 1998 ). Two cases of oral allergy syndrome to grapes: one of them with an episode of anaphylaxis and the other with exercise-induced anaphylaxis after eating grapes (Guinnepain et al. 1998 ). A woman with two episodes of urticaria, angioedema and diyspnea and one of anaphylaxis (Vaswani et al 1999 ). Exercise-induced anaphylaxis with wine (Garcia-Robaina et al 2001 ). Pastorello et al. (2003)  reported 14 adult patients with severe symptoms, 11 to grape and 3 to wine. Two showed OAS and others angioedema, laryngeal edema, urticaria, gastrointestinal symptoms, hypotension, asthma and anaphylactic shock. One case of anaphylactic shock after exercise. Commercial grape extract and fresh grapes (Anton et al. 1997) . Red grapes (Guinnepain et al. 1998) . Fresh red and white grapes and dried grapes (Giannoccaro et al. 1998) . Raisins and grape juice and with different species of fresh grapes (Bircher et al. 1999) . Pulp and peel of fresh white grape (Moscatel variety) and pulp and peel of blue grape (Rodriguez et al. 2001) . White and red grape juice (Senna et al. 2001) . 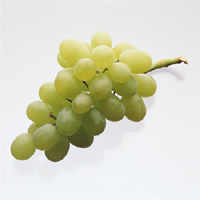 Commercial grape extract, white fresh grapes and white grape juice (Caiaffa et al. 2003) . Commercial grape extract and pulp or peel from fresh grape (Rodriguez et al. 2004) . Protocol: (controls, definition of positive etc)Prick test and prick-by-prick test (Anton et al. 1997 , Rodriguez et al. 2001) . Prick to prick test (Guinnepain et al. 1998 , Giannoccaro et al. 1998 , Garcia-Robaina et al. 2001) . The skin test was positive with a 10 mm wheal and 14 mm erythema above the saline control (Vaswani et al. 1999) . Prick-to-prick. The test was defined as positive with a wheal diameter of at least 3 mm (Bircher et al. 1999) . Prick test and prick-by-prick test. The tests were positive when a wheal diameter of at least 3 mm was observed (Caiaffa et al. 2003) . 3 patients who suffered anaphylactic reaction after eating fresh grapes (Anton et al., 1997) . Two patients. One of them experienced anaphylactic shock and the second patient developed exercise-induced anaphylaxis (Guinnepain et al. 1998) . A 24-year-old man with no family history of allergy suffered from oral allergy syndrome (OAS) after eating fresh grapes and drinking either white or red wine (Giannoccaro et al. 1998) . A 28-year-old woman (Vaswani et al. 1999) . A 44-year-old man (Bircher et al. 1999) . A 5-year-old female (Rodriguez et al. 2001) . A 33-year-old woman showing exercise-induced anaphylaxis (Senna et al. 2001) . A 19-year-old man (Garcia-Robaina et al. 2001) . A 28-year-old woman with allergic systemic reaction after eating white grapes (Caiaffa et al. 2003) . 14 children with allergic reactions after eating either fresh grapes or grape juice (Rodriguez et al. 2004) . Positive for 2 patients (Guinnepain et al. 1998) . The test was highly positive with the three fruits (Giannoccaro et al. 1998) . Positive (Vaswani et al. 1999) . Test was positive for grapes, whereas other grapes were skin-test negative (Bircher et al. 1999) . The test was positive (Rodriguez et al. 2001) . Positive (Senna et al. 2001) . Positive (Garcia-Robaina et al. 2001) . SPTs with fresh grape provided positive results to all the patients (Pastorello et al. 2003) . The skin prick test performed with commercial extract was negative but the prick-by-prick performed with white grapes and juice was positive (Caiaffa et al. 2003) . RAST (Giannoccaro et al. 1998) . CAP (Bircher et al. 1999 , Rodriguez et al. 2001 , Pastorello et al. 2003 ). A 28-year-olg woman with allergic systemic reaction after eating white grapes (Caiaffa et al. 2003) . Positive for all patients (Anton et al. 1997) . Positive in both patients (Guinnepain et al. 1998) . Serum gave a positive class 2 RAST (Giannoccaro et al. 1998) . Grape-specific serum IgE level was weakly positive (class 1) by RAST and negative by CAP (Vaswani et al. 1999) . No grape-specific IgE could be demonstrated in the patient’s serum (Bircher et al. 1999) . Specific IgE to grape was 1.1 KU/l (Rodriguez et al. 2001) . No grape-specific IgE could be demonstrated in the patient’s serum (Senna et al. 2001) . Specific IgE to grape was 4.13 KU/ml (Garcia-Robaina et al. 2001) . Grape-specific serum IgE level was 2.29 KUA/l (Caiaffa et al. 2003) . A 31 kDa protein was recognised by IgE from the sera of the 3 patients (Anton et al. 1997) . A 94 kDa protein was recognised by IgE in sera from a single patient (Rodriguez et al. 2001) . The patient had IgE against a 13 kDa protein (Garcia-Robaina et al. 2001) . A 94 kDa grape protein was recognised by serum IgE from patient no. 8. Patient no. 9 bound to 100, 60, 34, 28, 24 and 17 kDa proteins bands, patient no. 12 to 31 and 24 kDa, no. 13 to a 34 kDa and no. 14 to a 17 kDa (Rodriguez et al. 2004) . A piece of grape pulp applied in the internal face of the lower lip for 10 min (Rodriguez et al. 2001) . Muscat de Hamburg’ grapes (Rodriguez et al. 2004) . Lip open challenge (Rodiguez et al. 2001) . Open (Rodriguez et al. 2004) . Two children (Rodriguez et al. 2004) . Erythema and vesicles in the contact area (Rodriguez et al. 2001) . Positive in 2 of 2 patients (Rodriguez et al. 2004) . Guinnepain et al. 1998  reported a patient allergic to grape and peach and Giannoccaro et al. 1998  to grape and cherry. Cross-reactivity between latex and grapes has been identified (Frankland et al. 1999) . Caiaffa MF, Tursi A, Macchia L.
Rodriguez A, Trujill MJ, Matheu V, Baeza ML, Zapatero L, Martinez M.
Allergy to grape: a case report. Senna G, Mistrello G, Roncarolo D, Crivellaro M, Bonadonna P, Schiappoli M, Passalacqua G.
Pastorello EA, Farioli L, Pravettoni V, Ortolani C, Fortunato D, Giuffrida MG, Perono Garoffo L, Calamari AM, Brenna O, Conti A. Identification of grape and wine allergens as an endochitinase 4, a lipid-transfer protein, and a thaumatin. Anaphylaxis induced by exercise and wine. Vaswani S.K. , Chang B.W., Carey R.N. and Hamilton G.
Adult onset grape hypersensitivity causing life threatening anaphylaxis. Guinnepain M.T., Rassemont R., Claude M.F. and Laurent J. Oral allergy syndrome (OAS) to grapes. Giannoccaro F., Munno G., Riva G., Pugliese S., Paradiso M.T. and Ferrannini A. Oral allergy syndrome to grapes. Dohi M., Suko M., Sugiyama H., Yamashita N., Tadokoro K., Juji F., Okudaira H., Sano Y., Ito K. and Miyamoto T.
Food-dependent, exercise-induced anaphylaxis: A study on 11 Japanese cases. Asero R, Mistrello G, Roncarolo D, Amato S, Caldironi G, Barocci F, van Ree R.
Immunological cross-reactivity between lipid transfer proteins from botanically unrelated plant-derived foods: a clinical study. Rodriguez A, Matheu V, Trujillo MJ, Martinez MI, Baeza ML, Barranco R, Frutos C, Zapatero L.
Allergen properties & biological function:Chitinases have antifungal properties and are classified in the pathogenesis related (PR) families as PR3. Nature of main cross-reacting proteins:IgE binding to the 24 kDa grape component in grape extract was totally inhibited by cherry extract, probably by cherry thaumatin-like protein Pru av 2. Allergen properties & biological function:Due to high sequence identitiy of grape thaumatin-like protein and Pru av 2 (42% identity and 78 % similarity) it is though to display similar functions as other thaumatin-like proteins. These proteins have been included in the pathogenesis-related proteins classification as PR5 and are thought to be produced in response to pathogen infection or to osmotic stress. Other biochemical information:This protein might belong to the thaumatin-like protein family althouth this would be confirmed when the full sequence is available. Not known but likely to be thermostable and resistant to proteases as other members of the nsLTP family (Asero et al. 2000 ). Nature of main cross-reacting proteins:Grape LTP has 80 % identity to peach LTP. IgE binding of the grape LTP was totally inhibited by cherry extract, probably by cherry nsLTP Pru av 3. Due to the high sequence identity of grape LTP to peach LTP it is though to display similar functions as other plant nonspecific lipid-transfer proteins. They are thought to be involved in transport of fatty acids both intracellular and extracellularly and of cutin monomers to the cuticular layer of leaves and fruits. There is an expandable cavity between the four alpha-helices which can bind one or two lipids. nsLTPs have also been reported to act as plant defense proteins against bacterial and fungal infections and form the PR14 family of pathogenesis related proteins. It is possible that a lipid-like post-translational modification is involved (Lindorff-Larsen et al. 2001 ).